I’ll admit it - as I write this, the voice inside my head is saying “What a hypocrite!” I am an active smartphone user (addict? ), while at the same time, completely fearful of the direction our world is going with respect to technology. There are few things that look more ominous to me than a crowd of people standing together, eyes glued to their smartphone screens. 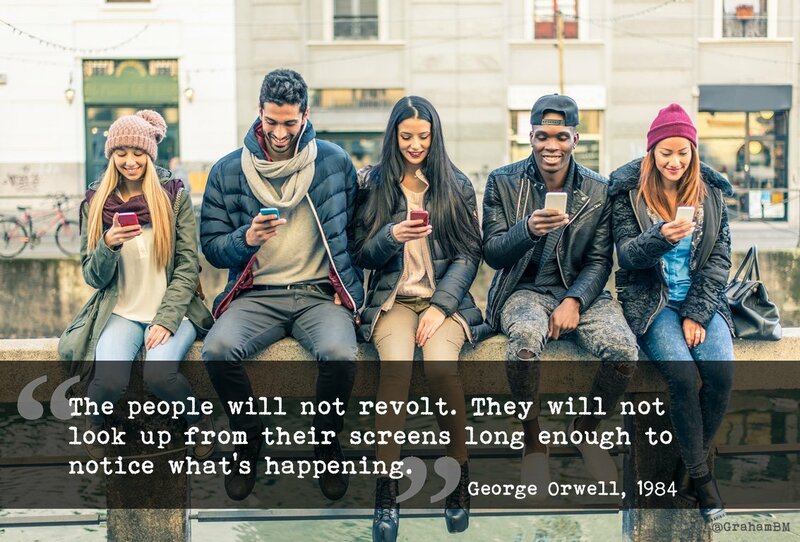 Studies show that Americans have never been more addicted to devices. Thanks to the mobile revolution initiated by the iPhone, there are more than 238 million mobile phones and 140 million tablets in the U.S. - many of which that are rarely powered down. And their numbers are growing, thanks to a perpetual upgrade cycle and demand for new features. 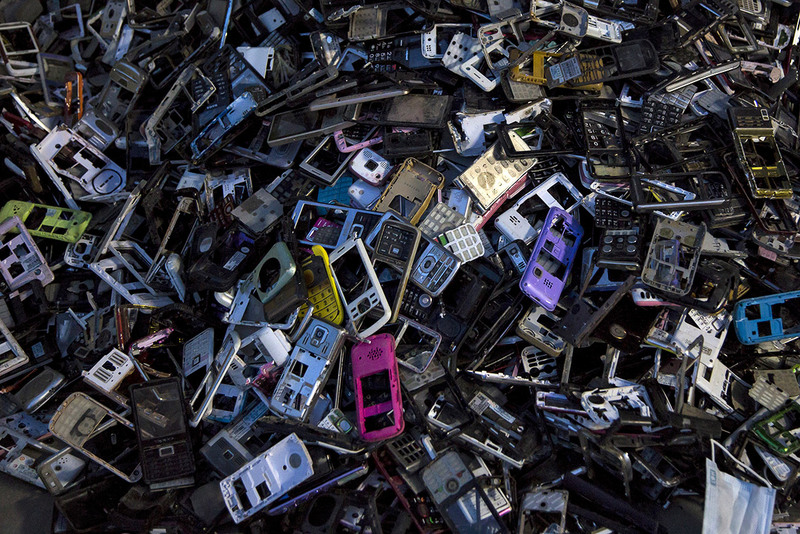 For environmentalists, it can feel like a looming electronic nightmare in which America's gadget obsession consumes increasingly higher volumes of the world's limited resources. But in the midst of these harrowing headlines, comes a sliver of a silver lining. While this may seem counterintuitive at first, considered that a smartphone has all but replaced any need for a TV or desktop computer for some. 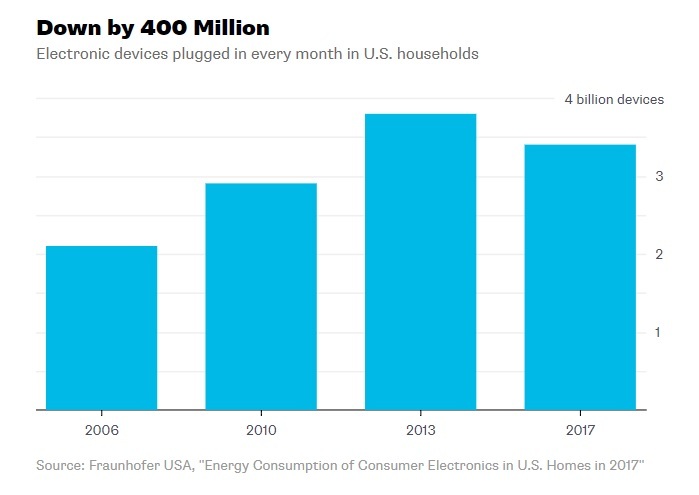 Americans’ 284 million TVs use 35 times more electricity than their 238 million smartphones. According to Bullard and Minter’s research, electricity isn't the only thing gadgets are consuming in smaller amounts. The shift away from heavy, traditional tube TVs to lightweight flatscreens, phones and tablets has resulted in a substantial decrease in the amount of raw materials going into electronics. They cited recent research led by Callie Babbitt, a professor at the Rochester Institute of Technology, which shows that the total weight of consumer electronics sold in the U.S. every year peaked in 2000 and had declined to 1993 levels by 2015 (the last year for which data was available) -- despite the fact that Americans consumed 350 million more devices in 2015. All this being said, there is still much work to be done. “Today's small gadgets may use less power and materials than previous generations did, but their size makes them difficult to repair or recycle. That shortens their lifespan -- a bad outcome for consumers and the environment alike. Want to learn more? Check out the full article here. The Future Is Now With Home Automation. But What Is It & Why Do We Need It?